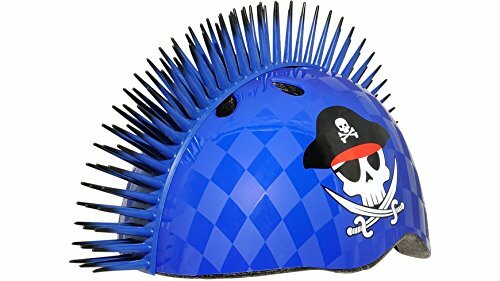 This pirate-inspired bike helmet is painted in a cool blue checkered design with huge painted skull and crossbones with an eye-patch on each side. It also features an eye-catching cool blue 2" tall bendable 3D Mohawk with black tips to round out the look. You'll look totally rad while you tear it up on your bike or skateboard in this helmet. But its not just fun and games with Raskullz Eye patch Pirate Mohawk helmet is really designed for protection. If you have any questions about this product by Raskullz, contact us by completing and submitting the form below. If you are looking for a specif part number, please include it with your message.